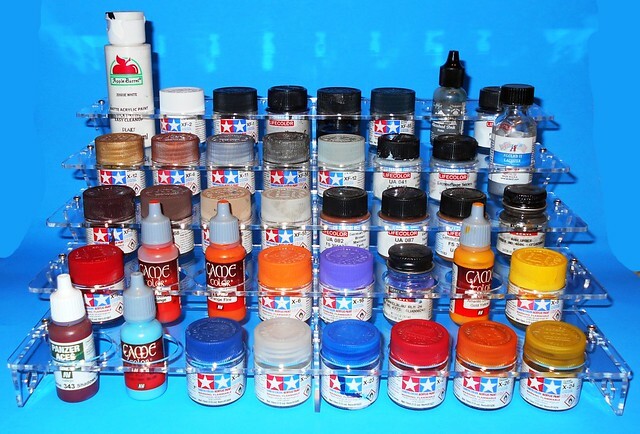 FOR THE MODELER: Because I use a variety of paint brands, finding a paint stand that would fill the need and fit ALL of my paints and different style bottles was a difficult task. It must also be tough and not fall apart easily or be damaged if it gets wet from the occasional spill. Searching the main producers I found most are made of thin fiberboard or cardboard. In fact, one brand got wet and was ruined in the package before I could even use it! I recently met Walter Kline, a fellow model builder and the owner of Hobby Escape Studios. He has created a really great paint stand called the “Aero-Classic Stand!” And, it is customizable to your liking! He also sells different styles from Corner stands to Tier stands that are laser cut to fit everything from the Testors Square bottles and up. They have built in brush holders and can even have big openings for the large thinner bottles from Tamiya. The stand is cut from clear Plexiglas and assembles with bolts and nuts. So it is much sturdier than the fiberboard competition. Once assembled and loaded with all 40 bottles of Tamiya and Model Master paint I was easily able to safely move this around on my desk and place it where I wanted because it is rugged! 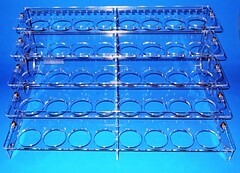 The dimensions are: 14″ Wide 11″ Deep and 5-1/2″ high at the back of the rack. FOR THE MODELER: Walter Kline, a model builder and owner of Hobby Escape Studios has created the perfect paint stick! The wand is cut from clear Plexiglas and it is much sturdier than others I have run across. The slots in the wand allow you to roll the tape quite easily and also stick a part through the tape to keep it from getting painted if needed. At this point he sells 2 sizes a small and large size. The larger one giving you roughly 6 inches of paint surface that attaches to and a 3½ inch handle. One of the greatest benefits I have found so far is I can use both sides for mounting parts to be painted. Just wrap the tape around it and place small parts on both sides to paint twice as fast without having all those paint sticks or alligator clips on sticks! I have found that because this is Plexiglas I can just soak the wand a few minutes in thinner and clean the overspray right off. The prices for the wands are very reasonable: Currently (June 2017) Only $3 for a full size and $2.50 for the smaller size plus applicable S&H. I highly recommend these hobby products and I think you’ll love them too! Walter Kline at Hobby Escape Studios. What are the dimensions of the paint rack, length front to back, width, & height? The dimensions are 14″ Wide 11″ Deep and 5-1/2″ high at the back of the rack. Thanks!